Baking food in packets is one of the simplest methods of producing a moist, flavorful meal. Simply add oil, spices, vegetables and meat or fish to a sheet of heavy duty aluminum foil for an effortless, complete meal. Sirloin in particular is well-suited for packet baking since it has a tendency to become dry and chewy. The juices and hot steam trapped inside the packet ensure a juicy sirloin every time. Sirloin cubes and strips take only a few minutes to cook, but steaks and roasts need extra time. Steaks and roasts benefit greatly from marinating for a few hours beforehand. 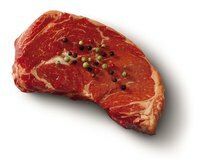 Select steaks that are an inch thick or uniform roasts for even cooking. Place a large piece of aluminum foil on a flat surface. Use a separate sheet of foil for each piece of meat. Drizzle the center of the foil with olive oil. Arrange sliced onions, garlic, peppers, potatoes or any other vegetables you enjoy over the oil. Sprinkle the sirloin liberally with salt and black pepper. You may also season it with any other herbs or spices you enjoy. Fold the foil over the sirloin and seal the top and both ends tightly, leaving space in the packet for airflow. Set the foil packet on a baking sheet and place it in the oven. Bake until the sirloin reaches your desired doneness. Cubes and strips of sirloin will only require about 15 minutes until they're fully cooked. Steaks will require about an hour and roasts will require up to three hours. Remove the sirloin from the oven and let it rest for five to 10 minutes before opening the foil packet. Take care to keep hands and faces away from the hot steam that escapes when you open the packet.